Turkey vultures are widespread. They were once persecuted for the perception that they spread livestock diseases such as anthrax. It has since been demonstrated that their digestive systems actually kill anthrax. Turkey vultures may still be killed by association with black vultures which many ranchers view as pests since they prey upon newborn calves. The biggest threat to scavengers such as the turkey vulture is lead poisoning from eating carcasses shot with lead ammunition. The U. S. Fish and Wildlife Service does not list turkey vultures on the Endangered Species List, and the International Union for the Conservation of Nature lists turkey vultures as “Least Concern” referencing a stable population. Turkey vultures are covered in a dark-brown to black plumage. The juveniles’ heads are covered with dark downie feathers, which molt with age leaving a featherless head which is pink to bright red in color. The naked head reduces surface area available for bacterial growth following the messy process of scavenging carrion. Their primaries and secondaries are grey in color, giving their wings a gray bar appearance when in flight. They weigh anywhere from just 0.8 kg to 2.0 kg, with variances according to “race” and location. There are currently six sub-species of turkey vulture. With the large amount of overlap between sub-species, they are generally termed races. Length is 25.32 inches, with a wingspan of 5.5-6.5 feet. Their wings are relatively large compared to their body, providing for better soaring capabilities. Turkey vultures lack well-developed vocal apparatus and therefore are limited to a range of grunts, hisses, growls and barking-like sounds. Their teetering soaring flight with their wings in a V-shape makes this bird unmistakeable in air. The black vulture, found more in the southeastern United States, is the most similar in appearance, but lack the red head color and gray bar on the wings, having instead a black head and gray at the wing tips. Turkey vultures range year-round from the southern tip of South America northward throughout Central America and into the southern portions of the United States. During breeding season turkey vultures range farther north to the Canada-United States border. Easily habituated to human activity, and with their unusual capability of finding hidden food with their incredible sense of smell, turkey vultures can be found in any habitat that has a ready supply of carrion, including forests that would be too dense for the visual foraging of other vulture species. The species as a whole is non-migratory, although those individuals in the middle- and northern-latitudes of North America will migrate. Those individuals in the northeastern United States migrate to the Gulf States and possibly the Caribbean islands. Western populations are long-distance migrants, traveling to South America for the winter. These diurnal scavengers forage independently for carrion using their strong sense of smell, one of the strongest in an avian species, as well as their keen eyesight. They readily eat roadkill or livestock carrion when available, but seem to prefer smaller, freshly dead animals. When they find larger animals, they must wait either for some decay to soften the thick skin or another scavenger to break the skin open. They have also been observed eating rotten fruits and vegetables as well as dung, although this is not a typical food source. Turkey vultures are monogamous, and will tend to spend more time with their mate than with any other vultures. The mating ritual generally begins on the ground with multiple birds in a circle hopping around with their wings partially open and may continue in the air with a ritual flap-and-dive pattern. Breeding in North America occurs March to June, with 1 to 3 eggs laid in a minimal nest of debris in a tree hollow, cliff crevice or old building. Incubation lasts 30-40 days. young vultures fledge at 70-80 days old and are fully independent one week later. Both parents care for the eggs and chicks. These diurnal scavengers forage independently during the day, but will roost with other turkey and black vultures overnight with some roosts being noted for reaching several hundred vultures. The turkey vulture’s body temperature drops approximately six degrees overnight to conserve energy. In the morning turkey vultures will shiver to regain normal temperature. A common posture of standing with wings outstretched in the morning sunlight can also serve to increase their body temperature. This behavior can also aid in “baking” any bacteria off the feathers, converting the oils used during preening to vitamin D, and in softening the feathers for easier preening. In the reverse scenario of high temperatures, they can dilate blood vessels on their head and neck to vent hear, leading to a much darker red color. Turkey vultures are not territorial and will move according to food availability. 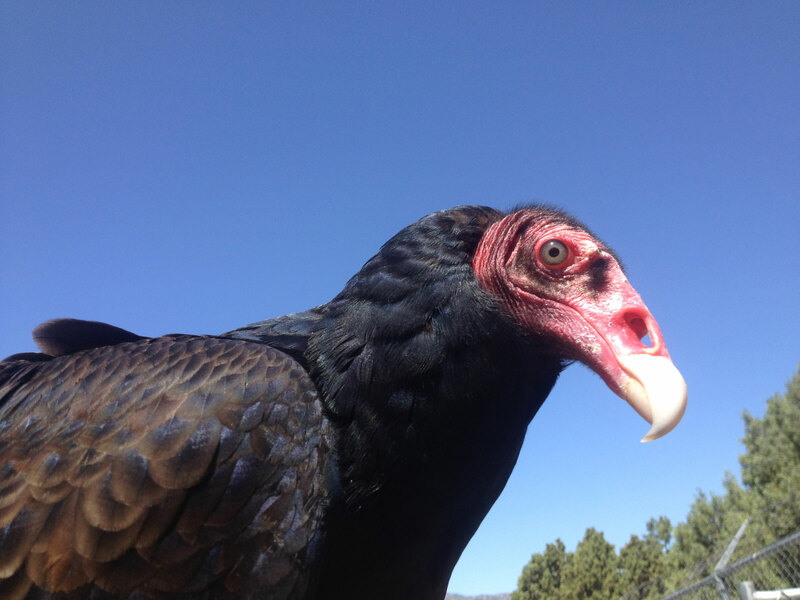 Other scavengers such as black vultures, which do not have as developed olfactory capabilities, will follow turkey vultures to carcasses and may out-compete the turkey vulture at the carcass. As scavengers, these birds are crucial for preventing the spread of diseases. While this species do not have many natural predators, turkey vultures are known for their defense mechanism of vomiting the putrid-smelling, semi-digested meat in their crops to deter the predator and lighten their own body weight to make flight easier. Nest predators such as raccoons may prey upon chicks and eggs, while great horned owls may occasionally take a turkey vulture. Turkey vultures are one of the few avian species capable of locating food just with their sense of smell. These birds do not have a voice box and have a restricted vocal repertoire. Turkey vultures pee on their own legs, a process called urohydrosis, to cool off. Their urine also has antibacterial properties which prevents infections. The olfactory cortex, or portion of the brain controlling the sense of smell, is three times larger in turkey vultures than in black vultures, and is the ninth largest out of 108 avian species. Gas companies will add chemicals found in decomposing animals to the gas in their pipelines. Then if the pipeline begins leaking gas, it attracts turkey vultures whose congregation identifies the location of the leak for the company to fix.